Come September H. Moser & Cie. will unveil its most complicated timepiece yet, the Venturer Tourbillon Dual Time. Here’s a sneak peek at the brand’s first ever tourbillon. Powered by the new HMC 802 movement, the new H. Moser tourbillon will be self-winding with a full rotor, and will also feature a second time zone display. 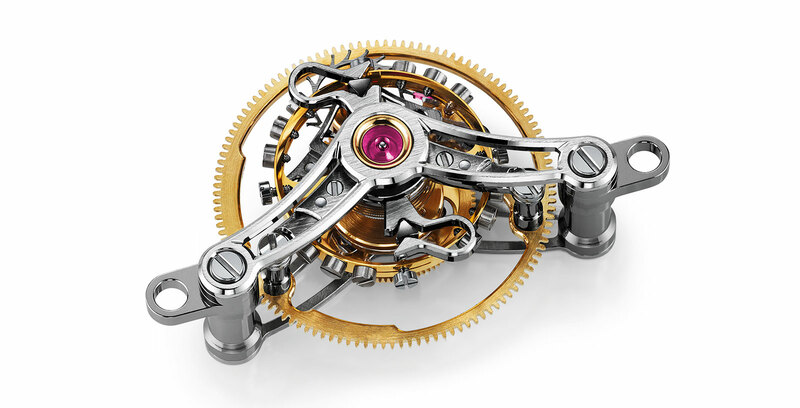 As is the case with all the brand’s movements, the tourbillon assembly will be interchangeable. The purpose of these interchangeable escapement modules is to allow them to be swapped out during servicing for a freshly lubricated and regulated module, speeding up the servicing turnaround. Additionally, the tourbillon will be equipped with the Straumann double hairspring, which breathes more concentrically than a regular, single balance spring. While the dial has not been revealed, the aesthetics will be similar to the Venturer Small Seconds that made its debut at Baselworld 2014, the first watch of the new Venturer line of vintage-esque timepieces. The profile shot of the case also reveals a very high domed sapphire crystal. This will be a big step upwards for Moser, given its most complicated watch at the moment is the Perpetual 1, though it is no ordinary perpetual calendar. The retail price will be US$98,000 or €74,000. Everything else will be revealed come September. Stayed tuned.